Passing the 65th parallel, I look around and wonder where all the ice is supposed to be. Ten miles later, I can see it distorted in the distance, a white wall stretching across the horizon. Be careful what you wish for. But as I near Wager Bay, the frozen blockade resolves into narrow bands of ice, distorted by distance and strange inversions. Approaching the bay the sun broke through, and for the first time in a week I felt in on my skin. It felt like a benediction. I get right to work, cruising slowly through the broken pack ice. I scan the broken ice for any signs of life. 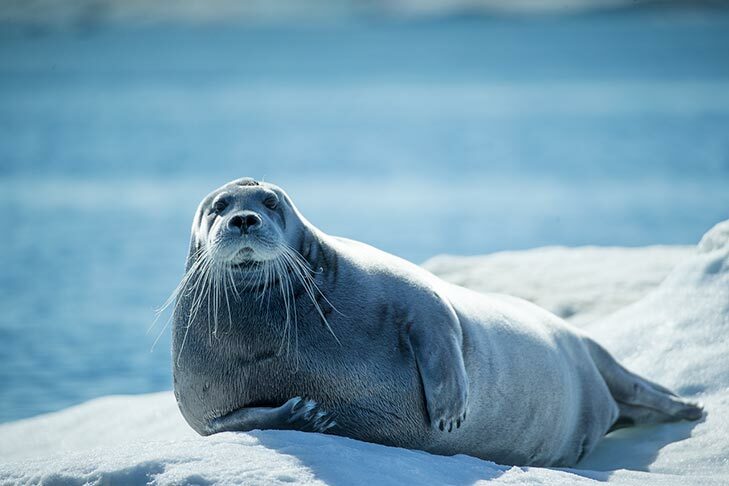 I spot seals a’plenty, basking in the evening sun, and even a pair of walrus being whisked past on the tide. But I’m loathe to admit that what I’m really after are polar bears. And my evening is unsurprisingly bear-free. Wager Bay forms a narrow channel more than 70 miles deep into the hinterlands here, and creates formidable currents and huge tides. I’ve been warned to steer clear the national park here without proper paperwork from Parks Canada, so I do my best to avoid arrest in a foreign country, even one as seemingly benign as this. The boundaries don’t appear on my nautical charts, nor on my topographical maps, nor on the gps. And it’s not like there’s a gate and a ranger or mountie or whatever taking your money and handing out maps. So I obey the spirit of the law at least, and set not one foot on dry land anywhere near where I think the park might be. So there. I resolve to not obsess about what pictures I’m not getting (I’m talking to you, mister “oh I’m too elusive for you” polar bear) and simply enjoy the place I’m traveling through. If all I see is icebergs, then I’m going to be a ice photographer. If it’s seals, I’m your pinniped picture man. And the seals are a delight. Ring seals are the quiet, elusive ghosts of the water. They are enthusiastically hunted by the local Inuit and come by their suspicions of human intention honestly. I often see them in the water, soulful eyes peering at me, head wavering in disquiet and curiosity before they vanish, sliding beneath the surface again. Their faces are a contradiction of curiosity and suspicion and surprise. Those huge liquid eyes seeming to peer into my soul, they are the essence of anthropomorphic cuddliness. But those whiskers. I can’t think of nothing but a fat man with his handlebar mustache. I have two words: Barbershop Quartet. I take what shots I can before my little baritone gives me a look of well-earned disdain and slips back into the sea and disappears. This entry was posted on Wednesday, August 12th, 2015 at 1:15 pm. It is filed under On the Road. You can follow any responses to this entry through the RSS 2.0 feed.